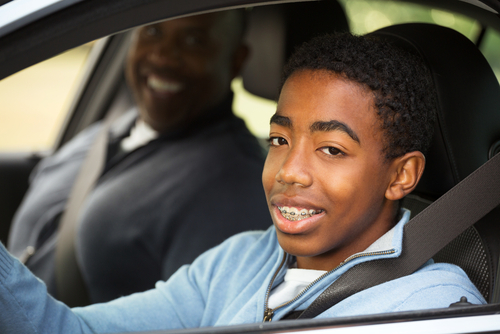 It’s possible that your insurance company will not require you to list your teen on your policy until he or she actually receives a license to drive alone. This could save you money during the period that your teen has a learner’s permit and can only drive with a licensed adult. Many parents cringe when they learn what it will cost to insure their teen drivers. But there may be a way to reduce those sky-high premiums. If parents drive expensive cars, their premiums will increase greatly once the insurance company factors in a teen driver — primarily because those pricey cars would be expensive to repair. In the long run, it could be cheaper to buy a used economy car and insure it with a separate policy in the teen’s name. The teen’s policy would be even more affordable if it did not include collision and comprehensive coverage. There’s a lot for mom and dad to think about when a teen slides in behind the wheel. Knowing the options may help parents deal with the extra costs — and stress — waiting for them down the road.